Create a new lead, generate a quote using your branded template and send it off. Then, track its progress through the sales cycle. SOLID’s Sales Management tools ensure your sales team always has a clear view of an order’s status without having to track it through multiple teams. Quickly and easily fill in quote details, lines and commissions. All activity and outgoing communication is captured within the customer’s details so their full history is available to you at the click of a button. Quickly and easily add leads, generate branded quotes, convert leads and view their order status through the progress bar. Automated proposal generation with the ability to email directly to the customer, complete with email tracking. 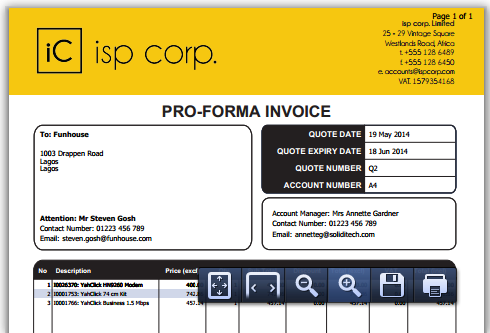 Invoices are generated and are available in real-time within the customer’s profile. The transaction is reflected immediately within your financials. All quotes are generated using your uniquely branded templates and are 128bit encrypted to prevent tampering. Reduce the amount of paperwork your sales team generates with EPA (Electronic Proposal Acceptance). Report on your sales funnel and sales activity from a number of dimensions such as product grouping and agent. SOLID is a web-based platform that is available anywhere, any time and through any internet enabled device – so it’s ready to work whenever you are. Regions are mapped out and their status monitored from within SOLID. SOLID uses GPS coordinates to automatically detect if a customer is ‘within region’ and adjusts workflow and/or pricing accordingly using dynamic price handling through our Quote Builder Tool. Improve your workflow by writing your own rules. Simplify and streamline your sales processes based on your unique business needs. Automatically assign Account Managers, Sales Managers and Collection Agents to reduce internal processing times and improve your bottom line. SOLID Sales Management is fully integrated with SOLID Billing, Financials and Collections through automated workflows. This means that every product and service that is added or removed from a customer’s account is invoiced and accounted for.